"Silent and Vibration Free ..... Stealth Operation. The Systems are offered in an Electric DC configuration with Brushless Permanent magnet motor designed as an integral part of the PumpJet Propulsor and designed as off-the-shelf Propulsion Modules. The module contains the PumpJet system designed as an integral module (carbon-fiber) with dual side intakes and discharge nozzle systems. 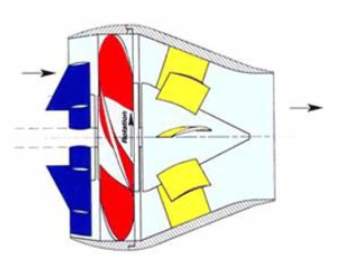 The module incorporates a “Quad” fin system for vehicle control and incorporates a complete PumpJet and electric fin actuator system. Covert surveillance in harbors and over the horizon in "other side" territory. Security related "obstacle" detection, positioning, classification and ultimately destruction. Shallow water autonomous control/operation of vehicle for vessel under hull attachment of obstacles such as mines or inspection for drugs packages. Harbor or at-sea operations. PumpJet Modules are rated for full ocean depth and are bolt-on modules. They are easy to remove and can be replaced within minutes. SubSea Propulsion Pumpjets are manufactured in hard anodized marine grade aluminum bodies (Carbon-Fiber Composite optional) and utilized for the PumpJet suction and nozzle assembly.